In order to see visual confirmation you must create or have existing Talkable campaigns. 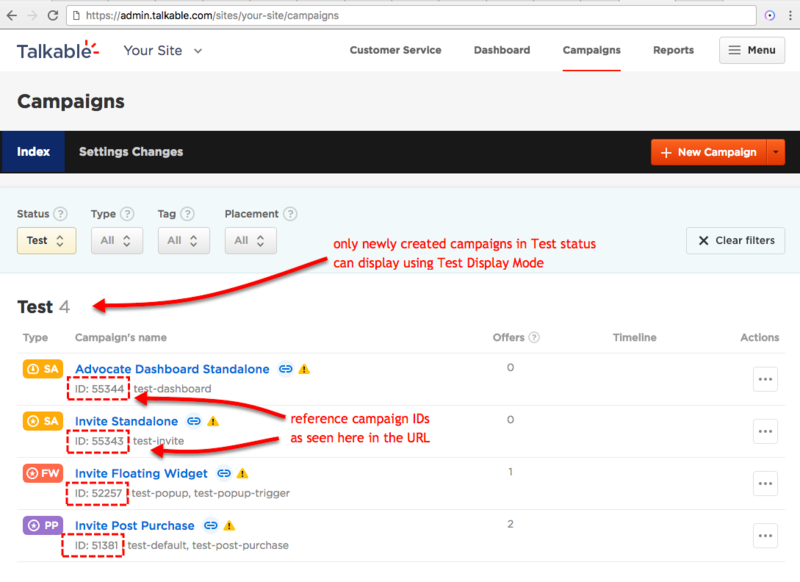 Campaigns must be enabled for visual display (see examples below on how to enable campaigns). Note that enabling campaigns on production will allow your customers to see referral content. If you want to limit visual display, or want to validate on your production site without customers seeing visual display, then see the Test Mode Display section below. Confirm Visual Result You should see visual confirmation content on the checkout confirmation page if the post purchase campaign is enabled. Confirm Data Result Navigate to Reports > Purchases tab inside the Talkable platform to ensure all parameters that you’re using in the post purchase script are being passed. Data populates in real time. Confirm Visual Result You should see the floating Talkable Widget button. Visit your Advocate Landing Page. Confirm Visual Result You should see visual confirmation content in the location where you placed the Talkable Container DIV. Visit your Referral Dashboard Page. You’ll need to have a campaign of each type in order to validate display.